How Long for a Mother Cat's Milk Supply to Dry Up? Kittens grow up so fast. Now that they're weaning and eating solid food, it's only a matter of weeks before their mother stops producing milk. This is an important time for the mama cat -- keep an eye on her to make sure she's healthy. Although they're 100 percent reliant on mother's milk at birth, kittens start eating solid food when they're 3 or 4 weeks old. Some kittens stop nursing immediately, but most switch gradually. Some kittens may try suckling at their mother's teats now and again until they're 7 or 8 weeks old. By the end of their eighth week of life, most kittens will have made the lifelong switch to solid food. The end of lactation is usually a process, not a full stop. During these later weeks, you may notice changes in the mother cat as nursing wanes and lactation begins to wind down. As a pregnant cat gets ready to deliver her kittens, her appetite usually increases. That's because she needs more calories and nutrients to produce life-sustaining milk for her offspring. These requirements dwindle as kittens begin weaning, especially during their seventh and eighth weeks of life. After that, mother cats begin eating less, start becoming aggressive toward kittens that continue to try to nurse on them, and stop producing milk. After about two weeks of this, most cat's breasts run dry. That means a healthy mother cat's milk supply usually doesn't dry up until her kittens are 10 weeks old. The longer kittens actively nurse, though, the further back this timetable is pushed. It's not unusual for nursing, weaning and lactation cycles to vary a week or so in either direction. If a cat's milk production stops suddenly before her kittens are 9 weeks old or continues after they're on solid food at 11 weeks, the mama cat may have a medical issue. Call a vet, especially in the case of the former, as the mother cat's kittens are still dependent on her for nourishment. It's not unusual for kittens to occasionally try and feed on their mother toward the tail end of the weaning process, even after the mother has stopped lactating. The mama cat may become aggressive and hiss or even bat her offspring. Don't worry: That's normal. But if that happens soon after the kittens are born, a medical issue may be at hand. Call a vet. Abnormal cat lactation can indicate a number of medical issues, which is why it's important to contact a vet as soon as possible. 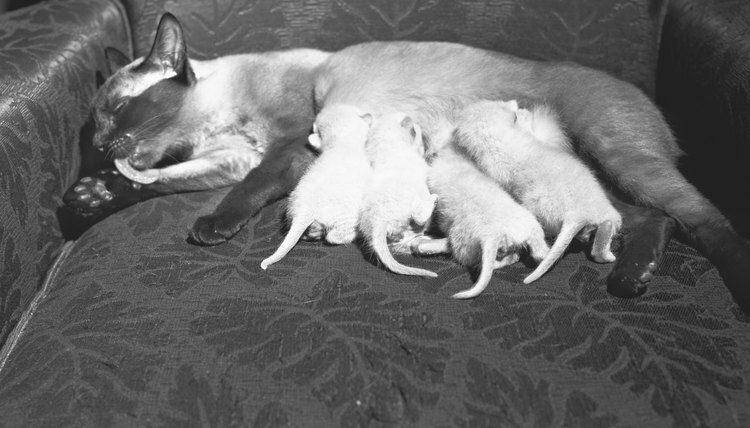 Feline mothers milk can be watery, particularly as lactation ebbs and flows, but should always be whiteish. Yellowish, brownish and even bloody milk can indicate mastitis or mammary gland infection. Firm, non-painful bumps on her chest or abdomen may indicate mammary gland hyperplasia, a benign tissue growth, or even cancer. Early cessation of milk production may mean blocked glands or could be a complication related to any number of illnesses. Continued lactation may mean another pregnancy or even a psuedopregnancy. Diagnostic methods and treatment options differ for mother cats who are still nursing, as their health and milk supply also affect their kittens. UC Davis: Mammary Masses - What Do They Mean in Your Cat or Dog? How Do Ocelots Raise Their Young?